Most consumers dispose of their chewing gum responsibly. 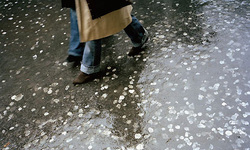 However, where chewing gum is dropped onto pavements it sticks firmly to the surface as it dries. 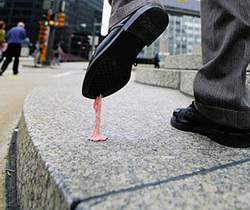 Chewing gum does not break down over time and so the deposits gradually accumulate. The government believes that these chewing gum deposits compromise the quality of public spaces in the same way as other litter. A national survey commissioned by U.S. EPA , annually, reported in 2009 that chewin gum was the major source of staining on pavement. The EPA reports that the greatest problems are around facilities such as schools, cinemas and swimming pools that are frequented by children and young people. who don't dispose of used gum properly.